Take a minute to discover her blissful combination of the English alphabet and her unique perspective behind the lense, as she captures her adventures like no-one else I've seen before! Enjoy my first Feature Post from Guest Blogger Ms. Amber D. Wilson! Although I’m a SoCal native, born in the heart of Los Angeles, before this past 4th of July weekend, I had never been to Santa Barbara. San Diego? Indeed. San Francisco? Dozens of times. 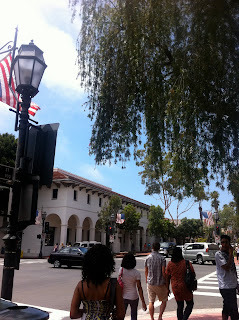 But somehow, Santa Barbara had seemed to slip off my radar and into the murky Pacific Oceans of my mind. And while I may have passed the age where I can appropriately sneak up to Santa Barbara to attend one of its notoriously wild UCSB parties, I wasn’t too old to pack my car with a duffle bag and a few friends, and head up the scenic101 route to finally visit this city. After a 2.5-hour trek filled with atrocious traffic, I found an endearing little city with big, bright blue skies and plenty of small-town charm awaiting me. I couldn’t help but incredulously stare in amazement at the Spanish-style storefronts that hugged the edge of towering, majestic mountains…or at the throngs of crowds that congregated on State Street, amongst its clusters of summery green trees and old-fashioned lamplights. It was all too adorable! I knew I had run into trouble when I found myself nervously fretting over which southern-inspired dish to order. Practically every item on the menu – from the Vanilla Dipped French Toast with homemade berry syrup and fresh whipped cream, right on down to the BBQ Pulled Pork Sandwich with homemade chips and caramelized shallot dip – sounds divine, worthy to be tried at least once. In the end, I opted for the Dungeness Crab Cakes and Potato Hash with avocado salsa, poached eggs and lemon butter sauce. I seriously can’t even begin to describe how amazing this dish is. It’s light and refreshing, yet hearty and filling. All of its flavors elegantly compliment one another: the tenderness of the crabmeat, the zestfulness of the avocado salsa, the crunchiness of the potatoes. It comes with two crab cakes, which are definitely big enough to share. My friends went with wraps and scrambles, which they seemed to enjoy as well. I recommend this place for a soulful yet fresh brunch, especially after a night of partying! 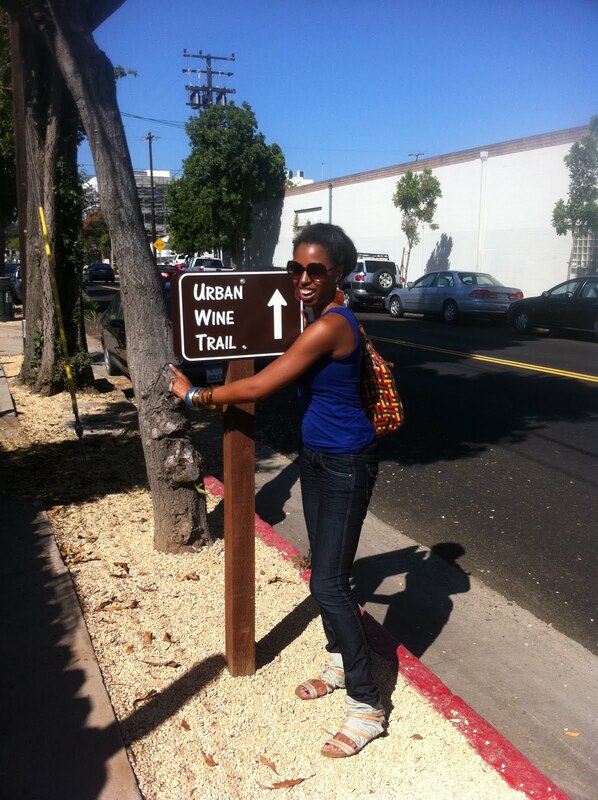 Santa Barbara has this amazing concept: connect a handful of very unique wineries and tasting rooms together through a walking wine tasting trail that winds through several blocks and streets. What you get is an exclusive opportunity to taste a variety of different wines in a very short amount of time. The tasting rooms are as diverse as the grapes growing throughout the Santa Barbara region, ranging in style, ambiance, and of course, wine. We visited three stops, and my favorite by far was Kalyra Winery. This festive tasting room had just the right balance of a welcoming environment, beneficial wine information, delicious wines and friendly, knowledgeable staff members. And, it stays open until 8pm on weekends, fairly later than most other places, which tend to close around 5pm. But most importantly, all of this came at the right price; a mere $10 gets you eight tastings of really delicious California wines, and even a souvenir wine glass. It’s a great spot to get the most value out of a Santa Barbara wine tasting room! OK. So this might be an obvious tourist destination, but sometimes it’s important to point out the obvious. 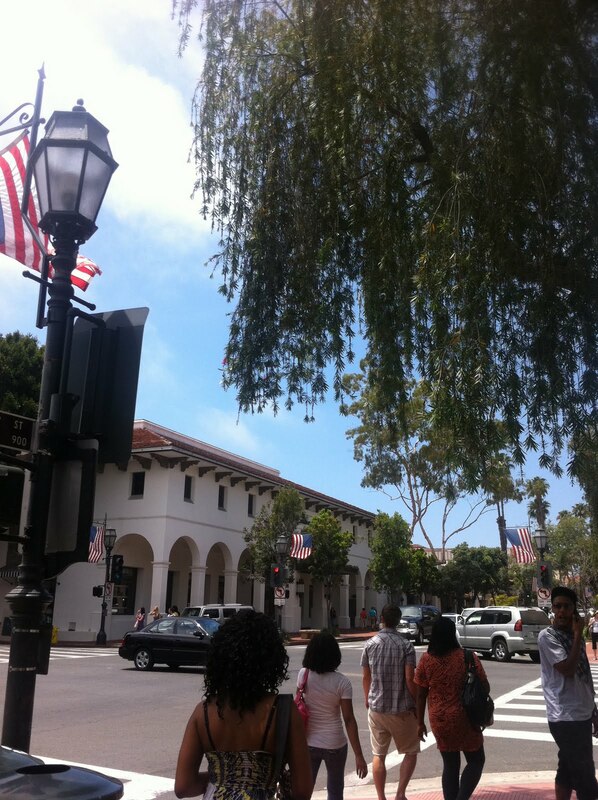 As the main thoroughfare in downtown Santa Barbara, State Street has a plethora of bars, shops, restaurants and nightclubs, ranging from the swanky to typical chain stores and also shops unique to the city. There’s something to explore, no matter the time of day on this street. Even if you grab breakfast here in the morning, that doesn’t mean you should skip painting the town pink after dark here as well; the whole character of this street changes with each hour. Drive down it for a serene, leisurely sightseeing tour (the numerous cars snaking down the street will give you plenty of time to see all of the highlights from the comforts of your car). Or if you’re in the mood to get a dose of exercise, it never hurts to walk the street. To the northwest, State Street has a more residential pocket, and the more southeast you go, getting into downtown and nearing the beach, it’s more active, with clusters of bars and a lively social scene. I recommend seeing it all, if you can! Unquestionably, there’s still so much that’s left to be explored in Santa Barbara – I’ve only cracked the tip of the iceberg. There’s the beaches, the clubs, the spas…But for a quick weekend trip out of the smog-infested streets of Los Angeles, I hope to leave you with a few spectacular options that I enjoyed on my first trip there. Happy travels, and perhaps I’ll see you there soon! About Amber D. Wilson: A native Angeleno with a penchant for exploring new places...but always returning to Los Angeles. When she’s not planning road trips, Amber is busily exploring the wonderful social activities that Los Angeles has to offer. Discover her favorite hangout destinations at her blog website, updated weekly, at www.wilsonswheretoguide.com. HUNTINGTON BEACH! #1 Beach in SoCal So Far! *If I interviewed you, OR mentioned that I had snapped some photos of you in action (volleyball, frisbee etc.) check out my tab j. lee photography and look for The Huntington Beach July 9th Album! It was Saturday afternoon and people were out in mass to enjoy the Sunny SoCal lifestyle; 85 degrees with a slight breeze, and beautiful women everywhere you turn! "What is it that you enjoy most about Summer in Southern California?" My first interviewee's! After sitting down and introducing myself, explaining my story, the blog and what this summer is all about, I studied their faces a little more and realized something terrible...not a one of these beautiful girls were smilling. Not even the tiniest little smirk of a smile! That needed to change for this interview to be a more enjoyable experience for both parties! It took me a minute to finally pull a smile out of them, but I'm happy to say that about halfway through our convo, they all opened up and gave me plenty to laugh about myself! "So ladies, what do you enjoy about Summer in Sunny SoCal?" Thanks for the Conversation Ladies! "So guys, what do you enjoy about Summer in Sunny SoCal?" Noi: -Perfect Weather, Liberal, The Beaches, There is always something to do, (and knowing her husband wouldn't admit to it, Noi also mentioned...) The Women! Sam: - Agreed with his Wife :) Thanks for the convo guys! These 3 were all smiles from the beginning! "So what is it that you all enjoy most about Summer in SoCal?" SoCal Native: Randy: -The Girls, "they are curvy, nice & actually approachable!" SoCal Native: Danube: -The Diversity of People and Cultures, 10 minutes to any Culture, Career Advancement is easy, "We are more in-tune with the young social generation, therefore we get all the good new jobs." (A little Cali Swag Danube?!) Haha get it girl! SoCal Native: Marco: -Everything is so close, "The beach, the mountains, downtown, just everywhere! ", Locals can Network with eachother, easy to get around on the $5 dollar metro day pass. Thanks guys! Chad L. Sammy W. Steven O. Zach Kevin V.
This group of boys! One of my more heartwarming stories of the afternoon, they are all recent Highschool Graduates from the State of Arizona Class of 2011. Congratulations guys! The boys are out in SoCal for the week for their last "hoo-rah" together as a crew before they all split up for college. "So boys, what is it that you enjoy about Summer in Sunny SoCal?" Arizona Tourist Kevin V. -Relax, "I've been workin all summer, I just need some rest. We came to SoCal because of the atmosphere of the people." 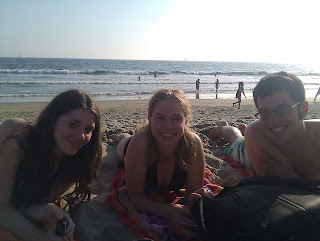 Rachel & Andrew both attend Cal State Fullerton. 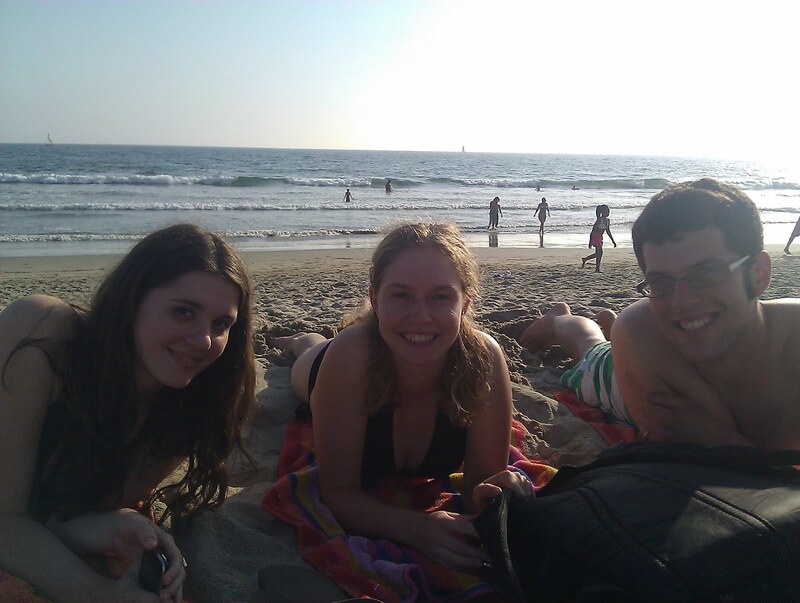 They are out for Summer Break, enjoying a beautiful Saturday afternoon at Huntington Beach! "So what do you two enjoy about Summer in SoCal?" And last, but certainly not least, my largest group of intervewee's to date! As such a large group I was inclined to put some skills I learned as an educator into some real life practice. I had the group split up into 5 groups of 2. Each pair was to decide as a group what they enjoyed most about Summer in SoCal...And here we GO! Group 5: Lia & Val: -The Climate, "it's Summery, Beachy, and airy, and people just come across as very nice!" Lets take it back...Missed Interviews from the July 4th Weekend! July 4th, 1776...Independence Day for the United States of America. As a history nerd I have a special place inside reserved for this holiday. So I was in an especially bubbly mood as I scanned the beaches of Venice, California for some other smiling faces to interview. My first group of willing participants: (from left to right) Katie, Ally & Alex from Wisconsin! "Ok! So my name is Jeremy, as you see on the card is says Germy. When I was a kid alot of my friends couldn't pronounce my whole name correctly, all they could spit out was Germy and the name kinda stuck! So about 6 months ago after graduation I moved out to Los Angeles and I've been here ever since! So I'm here talking to people about their different experiences in Southern California, and I'm interested in why California is so special. You guys all moved out here and I'd be interested to know, what brought you guys out here?" Katie: "TV and Film Production"
Ally: "Yea, she and I both are in that"
"Ok, cool! And thats what you guys went to school for in Wisconsin?" Katie: "uhh I did. I went to school for journalism and film"
Ally: "I did Journalism and History!" "Journa...HISTORY! History major! I went to school for secondary education so..."
Ally: "Cool! And then he went to school for education. Thats my husband, thats why he's here!" "I see, so he just followed you here! Alright." "So what was it about the film industry that you interested in?" Katie: "Well what do you mean? Like what part of it do I wanna work in?" "yea, exactly. I guess...did you being interested in it for school...did you know eventually that you were gonna have to come out to California to do something with it?" Katie: "Initially, no. But I had an internship my Jr. year where I went out to New York working at a production company in Brooklyn so I was hoping I could move to New York after graduation and everybody in New York that I was working for moved back to LA. So it's kinda just where everything is happening, where all the jobs are." "What have you been able to find job wise?" Katie: "umm I came out here with an internship at a production company, and its paid though so... I actually brought my...I work from home, I have a design job that I started up out in Wisconsin and I still do it here. SO I don't have anything full-time out here...I haven't even started looking, so I'm starting that right now!" "Ok, so you guys had come out, you said for film and production? What had originally gotten you interested in that? Was it a movie that you saw?" Ally: "Umm nothing particularly specific, but I'm just a really really huge television nerd! I watch alot of TV. Like Sci-fi and lots of other sh*t (laughing!). So that was pretty much it, I just like to do it, I watch alot of TV." "What specifically? Do you produce? Do you direct, do you write?" Ally: "I do...as of now I do nothing! But I'd probably be most interested in production." "ok, so bringing all those different things together, networking with people..."
"And you said that you had just followed her?" Alex: "Pretty much! I just got my degree in music education, and uh we got married a year ago and she wanted to come here so..."
"Alright well I appreciate the time you guys gave me, I'll have the interview up in the next few days! Thanks guys!" Katie: No problem, glad we could help out!" "its just dirtier than I had expected! Hollywood is not anything like you see on tv! The water here is very cold, I didn't expect that!" It was funny she mentioned the water, because that day was the first day the water had been warm enough for me to actually get in up to my waist! As a group they explained to me that the beaches of Southern Spain are much more desirable. Greetings readers! After weeks of anticipation to attend the World Famous 4th of July Celebrations at Huntington Beach, California...the day has come for my post! But first, let me get to why the following photo's and interviews happen to be in VENICE! Friend and Mentor Ben Miller asked me to assist him at the Mr. Mrs. Muscle Beach Body Building Competition 2011. The event was held on July 4th, at Venice Beach's World Famous Muscle Beach... a little conflict with Germy-in-SoCal's Huntington Beach 4th of July extraveganza! As a developing sponge trying to soak up photographic knowledge of all kinds, I couldn't turn down the opportunity to assist a professional photographer as he develops a growing portfolio. There will be plenty of weekends for me to head down to Huntington Beach, and you can bet it will be soon. Watch out Surf City, USA...I am long over-due to slip your sand between my toes! The Body Building competition was quite a sight to see! Competitors ranged in age from 18-76...76!!! After a very innocent bluf from Ben, we were able to snag a few back-stage press passes and be amongst the competitors as they were squeezing lifting sets in and being rubbed down with grease and bronzer before posing on stage. FULL PHOTO ALBUM of Mr. Mrs. Muscle Beach 2011 Here! These body builders were impressively shaping, shifting and flexing their enormous muscles. Contourting their limbs in un-heard of positions to make certain every judge on the panel could see every detail of the muscle they were being asked to flex! I have to say, my first time at a competition like this was a memorable one. As we photographed these massive men and women in their various poses backstage, I was tasked with the interviews. -"I began as a child, my dad/mom spent alot of their time at the gym and I picked it up"
-"Tryin to impress the girls!" One competitor in-particular admitted to living out of his car the first few months he began training. These guys are some of the beefiest, buffest mo-fo's around, and they take their training seriously! Venice's Muscle Beach, California holds 3 competitions yearly: Memorial Day, July 4th and Labor Day. Spectators can enjoy the show gratis, photo's are not restricted and the competitors are often very approachable and friendly (...often).